The artistic mastery of internationally revered artist Richard Diebenkorn will be presented in a premier exhibit at the College of Marin Fine Arts Gallery beginning Monday, September 30, 2013. The show is open to the public free of charge. The seven-week exhibit features 40 pieces, 38 of which have never been publicly viewed. The selected works on paper portray a richly intimate glimpse into the artist’s evolution spanning more than 40 years. The show, which includes pencil and ink drawings on paper, collages of torn paper and watercolors, is the first show to be produced by the Diebenkorn Foundation. The Diebenkorn Foundation provided a $20,000 grant to provide frames and packaging for the exhibit. College of Marin hopes to raise matching funds to pay for additional costs related to the staging of such a prestigious exhibit. Chester Arnold, chair of the Fine Arts Department at College of Marin, a painting instructor and artist, curated the exhibit. He sifted through hundreds of drawings, many of which were unframed in flat files in storage at the Foundation. Some of them were created in lean times for the artist on the back of old advertising posters for Mother’s Cookies and Pennzoil. For the Berkeley, California based Diebenkorn Foundation, founded in 2009, this first exhibit embraces the educational mission of the organization. Not only was Diebenkorn a life-long educator, but also the family has special ties to people at College of Marin. Chris West, College of Marin drawing instructor, artist and the new director of the College of Marin Gallery, describes the exhibit as akin to “pulling back the curtain on a developing master. It provides an intimacy that will empower students. Much of the work and more unseen pieces were published for the first time in two new books released this month by publisher Kelly’s Cove Press in Berkeley, CA. 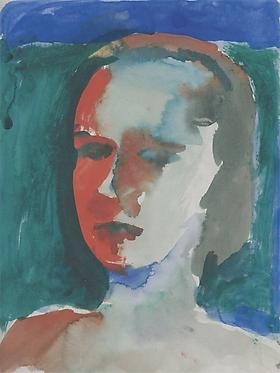 From The Model and Abstractions on Paper were released June 3 in connection with the College of Marin show. The de Young Museum in San Francisco is also hosting a completely different show– Richard Diebenkorn: The Berkeley Years, 1953-1966, opening June 22 and closing Sept. 29, 2013.